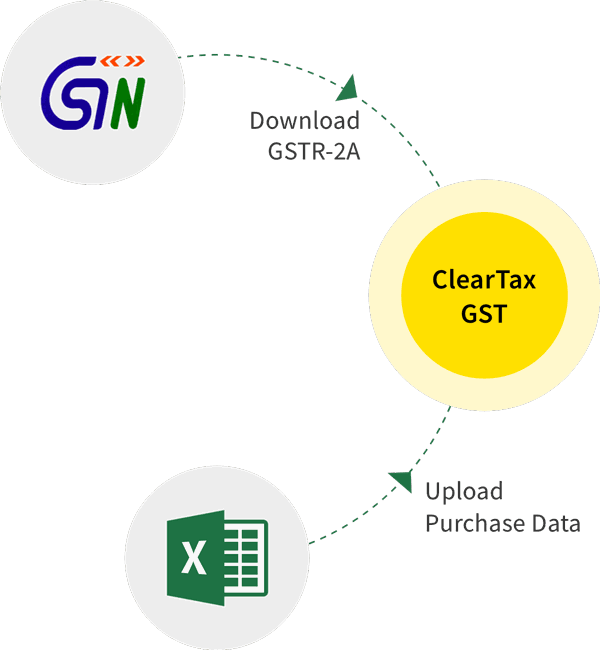 In our previous article, we had covered the form GST RFD-02 (acknowledgement) and the form GST RFD-03 (discrepancy memo). We will cover the form used for provisional sanction of refund by the proper officer (GST RFD-04) and the form used for payment of the final net refund. On application of GST refund, the GST Officer grants Provisional Refund in certain cases. Rules for Provisional Refund are made because the entire refund process takes quite a long time to complete. Meanwhile, exporter or genuine claimant can face working capital shortfalls due to refunds getting delayed. In order to cater to the short-term hardship of the exporter, the refunds are released on a temporary basis to the extent of 90% before a complete scrutiny of application and related records. Once a complete check is done within the stipulated time limit, the final order for sanction or rejection ( RFD-06 or RFD-08) replaces the provisional refund order (RFD- 04). Consequently, the actual refund amount decided in final order shall be adjusted for the amount already refunded on a provisional basis. Suppose, the GST officer rejects the refund claim, then the claimant has to pay back to the Government the entire amount that he received earlier. The Provisional Refund will be granted after Initial Scrutiny of the Application and documents by the Jurisdictional GST Officer. In these cases, The GST officer shall grant the provisional refund to the extent of 90% of the Refund claimed. The Refund claimed will be excluding the amount of ITC that got adjusted if any in the Electronic Credit Ledger on applying for the refund in RFD-01A/01. Provisional Refund shall be granted by the issue of Form RFD-04 within seven days of giving the Acknowledgement in RFD-02. This Provisional Refund amount is to be credited directly to the Bank account of the Refund applicant. Payment advice in RFD-05 is sent along for this payment. The Provisional Refund is not granted if the applicant was prosecuted for the offence under any Indian Laws where the tax evaded is more than Rs. 250 Lakhs anytime in the last five years preceding the tax period for which refund is claimed. The amount of refund claimed by the applicant, the balance amount left to be refunded later(10% of refund claimed), The amount sanctioned now on a provisional basis will be given under each category of tax- IGST or CGST and SGST/UTGST with cess if any. Point to be noted that the balance amount arrived at (iii) as per the form and the Provisional Refund sanctioned at (iv) need not be same. 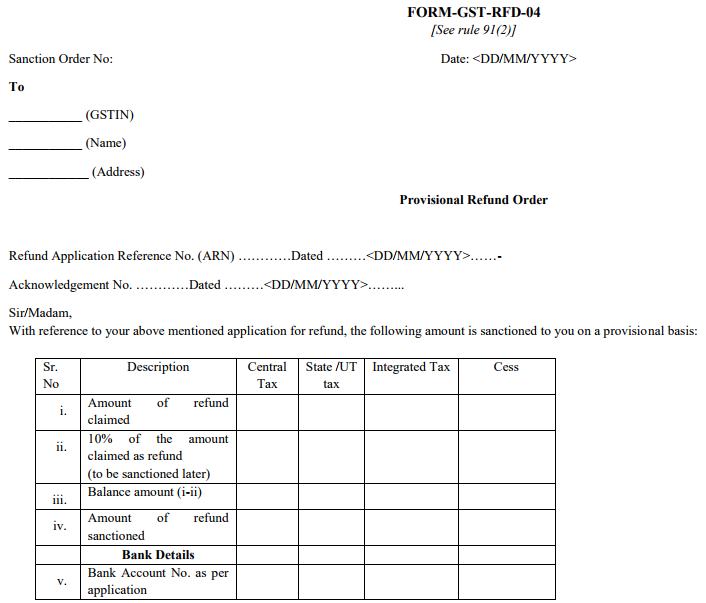 At last details of Bank account to which the Refund amount is credited shall be mentioned in the Form. The GST officer after scrutiny of the Application and the documentary evidence, after being satisfied about the genuineness of the claims made, shall issue the Payment advice in RFD-05 alongwith the Final Order of Refund Sanction. The GST officer shall transfer/ credit the Refund amount claimed to the account of Consumer Welfare Fund if there is any doubt regarding Unjust Enrichment i.e If there is suspicion that the claimant has passed the tax incidence to the buyer where the buyer has availed the ITC on same supplies. Any such Refund claims can be made by the aggrieved person by applying to the Fund with the necessary declarations and documents to prove the claim. Any other case of refund notified by Government.